One of the many ongoing projects here at Zelda Dungeon for the last few months has been the rebuilding of our Image Gallery. We have now relaunched a new image gallery and with it we have two new staff members who are helping in managing the project. Xindi and Kaitlin, known as Xinnamin and LozzyKate over at the Zelda Dungeon Forums are now both working on rebuilding the gallery and have done a nice job thus far as the gallery now features over 5,000 images and is constantly growing. One of my personal projects over the last few weeks has been managing the original Legend of Zelda section of the image gallery. As part of that process, I’ve been going through some old strategy guides, instruction manuals, and other print resources and getting high quality scans of all of the artwork that is available. With all the different resources out there, and many of them having their own unique artwork, there really is a lot out there. You can now check out all the artwork from the Japanese Million Publishing strategy guide, as well as all the artwork from the US Instruction Manual. 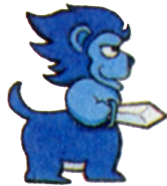 In particular the Million Publishing guide has some amazing chibi-like artwork, including the Blue Lynel that you see in this news post. Two of my favorite sets of artwork are the Legend of Zelda Enemy Artwork from that Million Publishing guide and the Legend of Zelda Scene Artwork from the instruction manual, all in the absolute best quality that you’ll find anywhere on the net. So what do you think of all this old artwork? Is it yet another element that makes the Zelda series special? Do you not care much about it at all? Would you like to see more of these types of things at Zelda Dungeon? Let us know by posting in the comments below!